To avoid finding yourself in a similar situation, you should always know whether to use an apostrophe in Valentine’s Day. How Do You Spell Valentine’s Day? Valentine’s or Valentines Day? In this post, I will compare Valentine’s vs. valentines. I will use each of these words in at least one example sentence, so you can see how they appear in the proper context. Plus, I will show you a helpful memory tool that makes choosing either valentines or Valentine’s easier for your own writing. So, does Valentine’s Day have an apostrophe? Let’s find out. How do you spell valentine? Before we look at the holiday, let’s look at the word valentine itself. Valentine can be a proper noun, in which case it refers to St. Valentine, the patron saint of courtly love. In this usage, it is always capitalized, forming Valentine. In modern times, valentine can also refer to a gift given to a lover or the person to whom such a gift is given. In these senses, it is a common noun and should not be capitalized. If you are lucky, someone will give you a valentine. I gave my entire class valentines as part of a school project. Valentine, when used to refer to a gift given to someone on Valentine’s Day, can be singular or plural. If you are only handing out one gift, you are giving away a valentine. As for the proper noun, there was only one St. Valentine; so pluralizing it as Valentines is not correct. How to spell Valentine’s Day: Valentine’s Day, so spelled, is a holiday celebrated on the 14th of February, commemorating the death of St. Valentine, a 3rd century Roman saint who is associated with a tradition of courtly love. Since Valentine’s Day is a holiday named after St. Valentine, it is constructed in a possessive formation, where Valentine is a proper noun, and the suffix –‘s indicates that Valentine possesses something. Think of Valentine’s Day as the holiday belonging to St. Valentine. In fact, the formal name of the holiday is St. Valentine’s Day, which makes it that much more obvious why there is a possessive formation. This Valentine’s Day, Carrie and I are visiting Rome. Bitter, single people avoid celebrating Valentine’s Day and often prefer to drink alone in their homes. See also, April Fools’ Day, Father’s Day, and Presidents’ Day. The holiday celebrated on February 14 is unequivocally spelled Valentine’s Day, so if you are writing about this holiday, always use the spelling Valentine’s. It is the day belonging to St. Valentine, not a day named after the plural noun valentines. 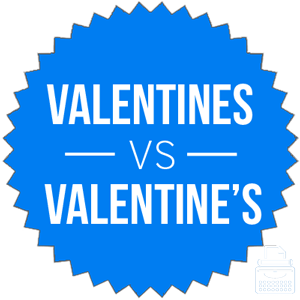 Valentine’s vs. valentines check: Since St. Valentine was the patron saint of love, and Valentine’s Day is a holiday celebrating love, remembering that Valentine’s is a possessive is an easy task. Is it Valentines or Valentine’s Day? Valentines and Valentine’s are pronounced identically, but they are not the same part of speech. Valentines is a plural, common noun that refers to either people that one loves, or gifts given to those people. Valentine’s is a possessive formation indicating that something belongs to Valentine, like the holiday Valentine’s Day. 1 How Do You Spell Valentine’s Day? Valentine’s or Valentines Day? Blimp vs. Zeppelin – What’s the Difference?